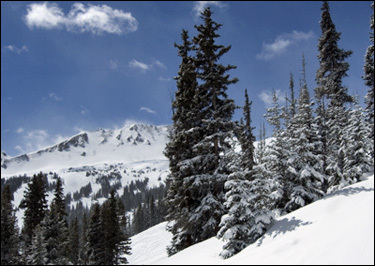 The transition from winter to spring in Colorado’s high country is usually a time to rejoice as abundant snow and sun can produce ideal conditions for downhill skiers. In fact, some skiers consider spring to be prime time for Colorado skiing and wait patiently until the equinox to get serious about skiing. Yet spring often brings harsh storms rolling across the mountains, challenging the skier to be prepared for all conditions. On the east side of the Continental Divide, at a base elevation of 10,800 feet, Loveland Ski Area accumulated a hefty base of 99 inches by early April, setting the stage for an epic spring ski season. 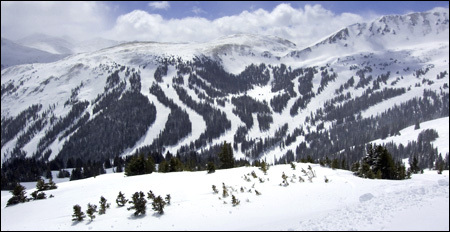 On Monday, April 4, the early morning ski report seemed to indicate that a magic convergence of spring skiing conditions was ocurring at Loveland — highlighted by 11 inches of new powder, according to my reading of the ski report. Off we went to savor the bounty. However, a fierce, unrelenting wind, which many consider to be Loveland’s trademark, stung skiers on this day, brushing some of the luster off the promising conditions. And, alas, there were no 11 inches of powder on the hill at 9 a.m. Maybe 3 or 4. Perhaps I read the report wrong, or perhaps the snow was in the next county, blown away by the stiff winds. Relatively small compared to Colorado’s larger ski resorts, Loveland is easily traversed across its expanse along the divide, giving powder hounds lots of opportunities to seek out and carve up untouched powder. Following a familiar route learned over the years, we rode Lift 1 up, then skied down the short, intermediate Spillway trail, then headed way over via Forest Meadow under Lift 6 to catch the midway point of Lift 2 where a boarding station provides passage up to the top of Lift 2 and the Ptarmigan Roost shelter. Riding up Lift 2 from the midway point is a good strategy for those seeking intermediate to advanced intermediate runs with good pitches. The glades of the South Chutes, Tomahawk and unnamed tree runs bordering the Poma Lift add to the variety of this part of the mountain. Although these runs are short, they often hold stashes of powder. The only downside to this strategy is facing the stiff wind at the top of Lift 2. Goggles, facemask and a hardy disposition are essential when the wind blows hard at Loveland. Catching Lift 2 at the midway, we rode the blistering Lift 2 up and rambled down the left side of the Firecut trail which held about 4 inches of relatively untracked, soft and wind-blown powder. The wind had sculpted small tufts of powder on Firecut and I was happy to blast through them. Options for searching out powder were limited this morning as Lift 8, serving Zip Basin, was closed, presumably due to high winds. Lift 4, however, offering access to the blue Scrub run and black (expert) Sunburst Chutes proved a good option (unloading halfway, thus avoiding the DNA-chilling ride to the top). Early on, the powder on Firecut and Scrub was soft, slightly windblown and generally excellent, however, the late spring break crowds at Loveland this day quickly skied and boarded through the precious virgin snow. In the afternoon, the skies opened up quite a bit and sunshine helped mitigate the wind. Venturing over to the now-opened Zip Basin, across the expansive Zip Trail, the awesome glades beneath Tickler Gulch were fairly well carved up by more alert skiers and snowboarders. This is usually one of the best places on the mountain for glade powder skiing. 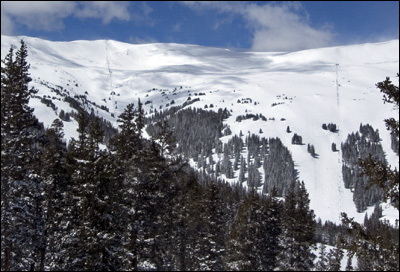 With the hefty snowfalls at Loveland this year, there should be plenty of good skiing left this spring. Both Loveland and A-Basin stay open past the typical mid-April closure of other Colorado ski resorts. We’ll be doing a little more due diligence, however, before getting too excited about a promising ski report. Using the $10 Ski the Gems card from Colorado Ski Country, a full-day ticket was $39.